Ealing's Volunteer Police Cadets recently attended Capital radio where they met actor Graham Cole, formerly Pc Tony Stamp from The Bill, and presented a cheque to Help a London Child for £2500. 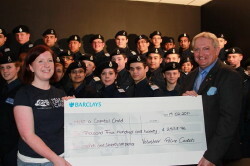 This money was raised by the cadets who held collections and fundraising events across the Borough earlier this year. The money raised will help a wide range of youth projects in the Capital. SGT James Rawlinson from Ealing Police said "This was an excellent group effort by our Cadets who all gave their time voluntarily to help raise money to help this London-based charity. We would also like to thank the shops and other businesses who allowed the Cadets to hold collections in their premises". Martin Lancaster, the borough cadet coordinator for Ealing said “I was so impressed by the cadet’s enthusiasm. They were all very willing to volunteer and get involved, and through their hard work and enthusiasm, we’ve been able to raise money for less fortunate young people. The nice twist is young people helping young people".